Cinnamon rolls are so good when they’re fresh out of the oven and freshly glazed; so good that I’ve been tempted to believe those prepackaged monstrosities from the convenience store (don’t tell anyone)! 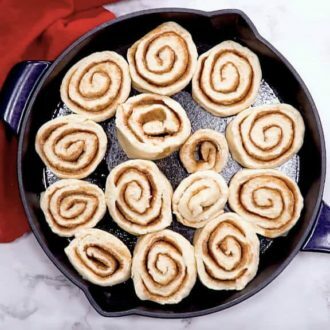 Anyhow these skillet cinnamon rolls are such a special treat. Perfect for a late morning treat with some coffee! I would heartily suggest adding some toasted pecans if you’re in the mood for a little something extra. What would you do to customize these? If you’ve tried these rolls then don’t forget to rate the recipe and let me know how you got on in the comments below, I love hearing from you! Probably the best use for a skillet I can think of. 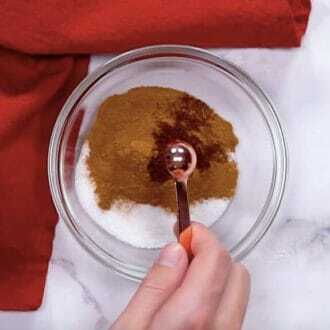 Mix 1 tbsp cinnamon and 1/2 cup sugar in a bowl and set aside. 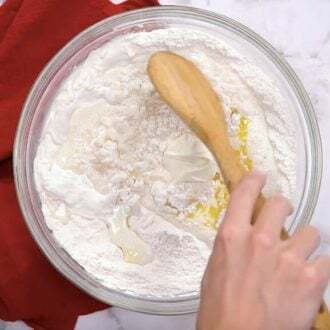 Whisk together the flour and 1/4 cup sugar in a large bowl. Add 4 tbsp melted butter and the milk to the flour mixture and stir until just combined. 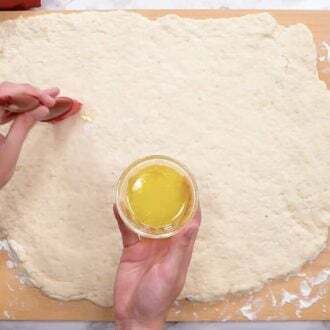 Roll dough out to a rectangle that’s 1/4 an inch thick and 24x10 inches. 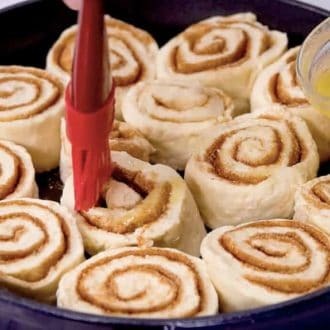 Roll the long side of the dough to create a spiral. Pinch the seam so the spiral doesn’t unravel and roll your log so the seam is far down. Cut the dough into about 15 pieces. 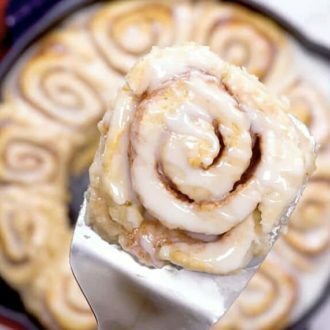 Place the rolls cut side up in a skillet and brush the tops of the cinnamon rolls with the remaining 2 tablespoons of melted butter. Bake for about 30 minutes or until a wooden skewer comes out clean from the center. 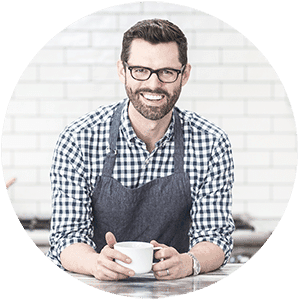 Allow cooking in the skillet on a wire rack for about 20 minutes. 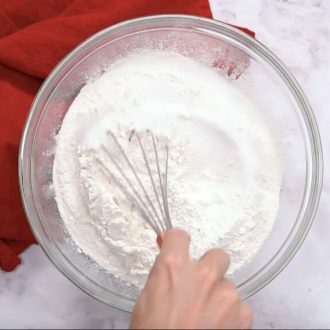 Place the powdered sugar, milk, and salt in a medium bowl and whisk until smooth. 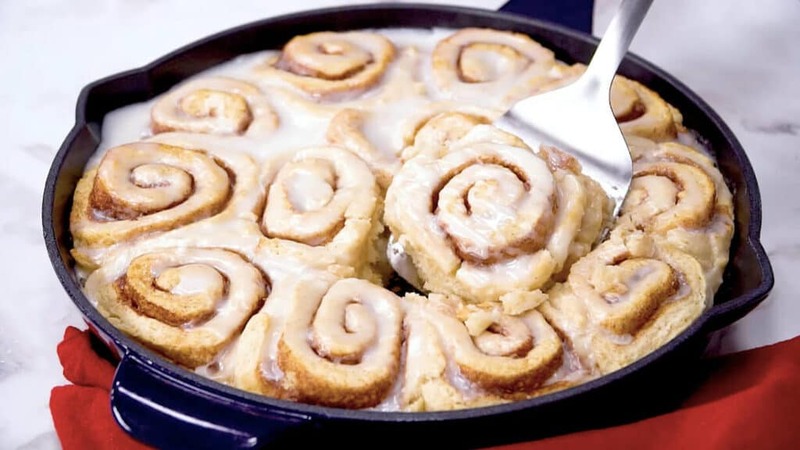 Drizzle over the cooled cinnamon rolls and serve. 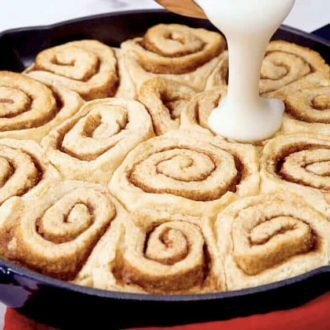 Should a cast iron skillet be preheated for baking? Mine takes seversl minutes before getting hot enough to cook in and surely that affects baking time and texture. Hi Peggy — Traditionally I would say “no,” however, it sounds like your oven could use a head start. If you ultimately preheat the skillet, please let me know how it comes out! Best, John. I don’t see the amounts for the icing. Made these for brunch today, and it was wonderful. And so quick! Obliterated my diet. I warmed my skillet up in the oven first, and it worked out well. Also just made my self rising flour; this recipe didn’t seem to mind a bit. Yay! I need to make another batch of these soon!